Richard Elliott Friedman, who holds a Th.D from Harvard, is the Ann and Jay Davis Professor of Jewish Studies at the University of Georgia and the Katzin Professor of Jewish Civilization Emeritus of the University of California, San Diego, and was a visiting fellow at Cambridge and Oxford and a Senior Fellow of the American Schools of Oriental Research in Jerusalem. He is the author of seven books, including the bestselling Who Wrote the Bible? and Commentary on the Torah. He participated in the City of David Project archaeological excavations of biblical Jerusalem and served as a consultant for PBS’s Nova: The People of the Covenant: The Origins of Ancient Israel and the Emergence of Judaism and A&E’s Who Wrote the Bible? and Mysteries of the Bible. 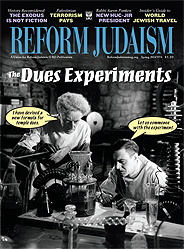 Following publication of Reform Judaism’s Spring 2013 edition in which Professor David Sperling and Rabbi David Wolpe asserted that the biblical Exodus is a fiction, you wrote expressing concern to the magazine editors. Why? After reading those articles, your readers may have concluded that scholarship shows that the Exodus is fictional, when, in fact, that is not so. There is archaeological evidence and especially textual evidence for the Exodus. I respect Professor Sperling and Rabbi Wolpe. They were understandably following the claims of some of our archaeologists. Those archaeologists’ claims that the Exodus never happened are not based on evidence, but largely on its absence. They assert that we’ve combed the Sinai and not found any evidence of the mass of millions of people whom the Bible says were there for 40 years. That assertion is just not true. There have not been many major excavations in the Sinai, and we most certainly have not combed it. Moreover, uncovering objects buried 3,200 years ago is a daunting endeavor. An Israeli colleague laughingly told me that a vehicle that had been lost in the 1973 Yom Kippur War was recently uncovered under 16 meters—that’s 52 feet—of sand. Fifty-two feet in 40 years! Still, all of us would admit that two million people—603,550 males and their families, as the Torah describes—should have left some remnants that we would find. But few of us ever thought that this number was historical anyway. Someone calculated long ago that if that number of people were marching, say, eight across, then when the first ones arrived at Sinai, half of the people would still be in Egypt! It wasn’t until a much later source of the Exodus—the so-called priestly source, some 400 years later—that the number 603,550 males was added to the story. So are you suggesting that a smaller group may have left Egypt? And if so, who might they have been? Yes. At a recent international conference entitled “Out of Egypt” on the question of the Exodus’ historicity, one point of agreement, I believe, among most of the 45 participating scholars was that Semitic peoples, or Western Asiatics, were in fact living in Egypt and were traveling to and from there for centuries. And the evidence indicates that the smaller group among them, who were connected with the Exodus, were Levites. The Levites were members of the group associated with Moses, the Exodus, and the Sinai events depicted in the Bible. In the Torah, Moses is identified as a Levite. Also, out of all of Israel only Levites had Egyptian names: Moses, Phinehas, Hophni, and Hur are all Egyptian names. We in the United States and Canada, lands of immigrants, are especially aware of how much names reveal about people’s backgrounds. The names Friedman, Martinez, and Shaughnessy each reveal something different about where they came from. Levites have names that come from Egypt. Other Israelites don’t. Present scholarship on the question of who wrote the Bible bolsters this picture that the Levites were the group who departed Egypt. The Five Books of Moses were not written by Moses but by authors of four main texts, known as J, E, P, and D. Three of the four texts—E, P, and D—are traced to authors who were Levite priests, and these three are the only ones telling the story of Moses, Pharaoh, and the plagues. The fourth main source, called J, the one that shows no signs of having been written by a Levite priest, makes no mention of the plagues. It just jumps from Moses’ saying “Let my people go” to the story of the event at the sea. The Levite authors also devote more ink in Exodus, Leviticus, and Numbers to the Tabernacle—the Tent of Meeting which held the ark in the Exodus account—than they do to any other subject. The non-Levite text, J, doesn’t mention it. This is also significant because the architecture of the Tabernacle and its surrounding courtyard matches that of the battle tent of Pharaoh Rameses II, for which we have archaeological evidence, as was shown by Professor Michael Homan in a brilliant combination of archaeology and text (To Your Tents, O Israel, 2005). Professor Sperling had emphasized in the RJ article that, archaeologically, there are no Egyptian elements in Israel’s material culture. But in the Tabernacle we do have those Egyptian elements. Egyptian culture is present, but, again, only among the Levites, not all of Israel. Likewise, only the Levite authors emphasize that males have to be circumcised, which was an Egyptian practice. They write of God commanding Abraham to make circumcision the sign of the covenant (Genesis 17), and they include the commandment for all males of Israel to do so (Leviticus 12:3.) Only the non-Levite source, J, does not command it. Again, the connections with Egyptian culture are there—but only among the Levites. And the Levite authors are also the ones who explicitly insist that Israel must not mistreat aliens (foreign residents). The first occurrence of the word “Torah” in the Torah, in Exodus 12, says, “You shall have one Torah for the citizen and the alien.” The Levite sources say it about 50 more times, and several times tell us why: “Because we were aliens in Egypt!”—we know how it feels. And, again, the non-Levite source, J, doesn’t command this. This most explicit reflection of the Egyptian experience in Israel’s culture occurs in all of the Levite sources and not in the non-Levite source. So if you’re talking about the Levites rather than all of the Israelites, the argument archaeologists have made that we haven’t found evidence of Egyptian cultural influence on the Israelites is not true. It is present in the Egyptian names, circumcision practices, the teachings about aliens, and in the design of the Tabernacle. Is there any other evidence that the Levites left Egypt at the time of the Exodus? Yes, and it comes from one of the earliest writings in the Bible, the Song of Deborah, composed in Israel in the 12th or 11th century B.C.E. After the Canaanites suffer a major defeat, Deborah summons the victorious tribes of Israel. In uniting the tribes, which constitutes the founding event of Israel’s history as a nation in its land, 10 of the tribes are summoned—but noticeably absent is Levi. Their absence is perfectly consistent with all of the other facts we have observed. The Levites weren’t there in Israel yet; they were in Egypt. Think of this: The two oldest texts in the Bible are the Song of Deborah and the Song of Miriam. The Song of Deborah, in Israel, doesn’t mention Levi. The Song of Miriam, in Egypt, doesn’t mention Israel! If the Levites were latecomers to Israel, how did they convince the Israelite tribes to adopt the Exodus story as their own? The Levites were not people to whom one said “No.” Four different biblical texts connect them to violent acts. Levi is one of the brothers who massacre the city of Shechem for the violation of Dinah (Genesis 34), and he is also cursed for his general violence in Jacob’s deathbed testament (Genesis 49). The Levites slaughter the people associated with the golden calf incident, thus following Moses’ command to put them to the sword (Exodus 32:26–28). And in the poem at the end of the Torah (Deuteronomy 33), God is asked to “pierce Levi’s adversaries’ hips, and those who hate him, so they won’t get up.” These four texts come from four different authors. So basically everyone knew: You don’t mess with the Levites. So they reached an agreement: The Levites got the priesthood, which included some cities (Joshua 21:13) plus a tithe (10%) of Israel’s produce (Leviticus 27:30). One of the Levites’ main tasks as priests was to teach Torah to the Israelite people. Deuteronomy 33:10 says, “They’ll teach your judgments to Jacob and your Torah to Israel.” Leviticus 10:11 commands that they are to teach what God spoke through Moses. Naturally, when the Levites taught Torah, they taught the tradition they had brought with them out of Egypt. And that is how every Israelite child learned, “We were slaves in Egypt and God brought us out with a strong hand and an outstretched arm.” Much later, this Torah passage was placed in the haggadah—which is how most of us know it today. And that is how a historical event that happened to the Levite minority became everybody’s celebration—how we all came to say that we were slaves in Egypt, although that was not the experience even of most Israelites of the period. It’s not so different from practicing, say, the American cultural tradition of Thanksgiving, which most Americans do, even though most U.S. citizens are not descended from Pilgrims or Native Americans. How else did the Levites influence Jewish thought? The Levites worshipped the God Yahweh, while the Israelite tribes worshipped the God of Canaan: El. Once the Levites arrived on the scene, the tribes needed to make a decision as to which God they would worship—Yahweh or El. They could have decided to worship both, in the manner of the pagan peoples around them who worshipped more than one god. They could have developed a mythology in which Yahweh was the son of El, or El the son of Yahweh, just as the pagans did when they said that Ba’al was the son of El. Alternatively, they could have decided to worship only El or only Yahweh. Instead, the tribes decided that El and Yahweh were one, in essence saying, “the same God by a different name.” That explains why two of the Levite-authored sources (E and P) both developed the point that God was known as El until the time of the Exodus, and then God revealed to Moses that his true personal name was Yahweh (Exodus 6:2–3 and Exodus 3:15). El and Yahweh were one and the same. This decision was a crucial step toward the victory of monotheism over pagan religion. Who knows how long it would have taken—if ever—to have developed monotheism as we know it in Judaism if we had spent our first few centuries believing in two primary deities? So, what we have been discussing here turns out to be vastly more important than just the question of whether the Exodus was historical. If the picture that I’ve been describing based on the facts that are known to us is correct, then those events were foundational to Judaism ever after. Given the centrality of the Exodus story to Jewish tradition, does it really matter if the Exodus was history or a foundational myth of Judaism? First, history is part of our legacy. The Jews, in fact, invented the writing of history. Prior to the court history of King David in Second Samuel, there was no history writing anywhere on Earth. We Jews haven’t taken enough cognizance of this. We’ve accepted the prevailing notion that the Greek historian Herodotus, who lived in the fifth century B.C.E., was the father of history, when in truth the court history of David, probably written in the ninth or eighth century B.C.E., preceded Herodotus by some 400 years. Second, history is exhilarating. Think of the excitement we feel when an archaeologist verifies or challenges something in the Bible and we read about it on the front page of The New York Times, like when Avraham Biran of the Hebrew Union College uncovered the “House of David” inscription, the very first confirmation of the dynasty of David in an archaeological artifact, just 20 years ago. I’m not arguing that everything in the Bible is factual. I may not believe, for example, that the world was created in seven days, or that humanity began with two naked people and a magic tree and a talking snake. But real evidence exists that the Exodus is historical, with text and archaeology mutually supporting one another. What lies next for us is to give due consideration to this evidence and refine it further in our work.